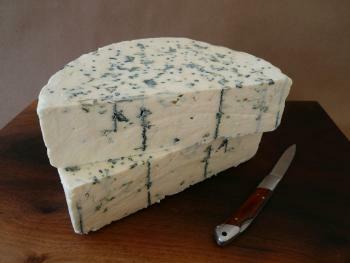 Like a chunk of marble, with threadlike veins of blue-gray mold in a chalk-white paste, Point Reyes Farmstead Original Blue is creamy with an elusive, salty flavor that is attributed to the coastal fog and briny breezes flushing around the pastureland. On the tongue, it is dense, moist and creamy with a pronounced buttermilk tang. The cheese is aged for at least six months, giving it plenty of time to develop its sea-blue veins and deep, luscious flavor. The cheese has no rind. Just before shipping, it is wrapped in foil to protect it and keep it from drying out.